Buckle up, adventure junkies! Plan a hike up the enchanting trails of Arizona’s hills, creeks, and forests. When it comes to beautiful hikes, Arizona has no shortage of sights that will take your breath away. Check out the 15 best hiking trails below. The high walled gorge is covered by thick forests on both sides of the trail. Also, the gentle streams and soaring cliffs offer a wonderful combination. This trail along the Grand Canyon offers a sunlit pathway with a plateau 1.5 miles away. The trail also rounds past the O’Neill Butte and Skeleton Point with a majestic view of the Colorado River. Wildcat trails are among the few passages that hikers can pass through independently without a Navajo guide. The trail is pretty close to the Mittens Formations. Hugh Norris offers a sweeping view of the looming mountains and steep cliffs. Set in the Saguaro National Park, the trail cuts through the beautiful Sonoran landscape leading to the Watson Peaks (highest in Tucson). The Horton Creek is open all through the year and the nearby forests offer a spectacular trial. The mini falls and springs widen to a natural pool. This trail hidden in the southeastern portion of Arizona, offers naturally sculpted columns, boulders, and exotic beauty. The shortest path is the heart of rocks that wanders through scenic rock gardens with stunning sculptures such as Thor’s Hammer, Duck on a Rock, and so on. The Sycamore Rim offers a lot of twists and turns running through the grasslands, pinecone forests, and wood cabins. The Dow Spring is the prettiest with water lilies blossoming along the way. You can also spot the usually dry Sycamore Falls on the way. The city of Kingman is peppered with pretty trails slashing across the Cerbat Foothills Recreation Areas. There are three trailheads and multiple forks in the path with boulders and heaps of volcanic ash. From the meandering Colorado River to the green meadow and thick forests, West Baldy offers everything! The trail ends up to the Fort Apache summit that is open only to the tribal members. Perfect for beginners, Kachina Trail follows a gentle rolling course across the San Francisco Peaks, with small cliffs and boulders in between. The conifer, maples, and other deciduous foliage along the passage opens up to a pretty view of the hills and nearby dwellings. A pretty trail along the Grand Canyons, Bright Angel Trail meanders to and fro the Colorado River. You can set up camps at the Indian Gardens where you have a steady supply of fresh water. The Lone Pine Trailhead is set to the north east of Phoenix, about an hour’s walk. The narrow passages and rocky trails can be quite a challenge for hikers but the majestic view of Flagstaff’s snowy peaks is worth it. The Camelback Mountain range can be spotted easily from the outskirts of Phoenix, the hike starts at Echo Canyon Trailhead and goes up to a whopping 1,262 feet! The path is sprinkled with rocks and boulders, an amateur hiker’s heaven! The high plateau like terrain at the end of the trail offers a breath taking view of the Four Peaks, the Superstition Mountains, and the city of Phoenix. The trail begins from the Siphon Draw Trailhead, but the frequently used path can be quite steep and challenging at times. The shockingly turquoise falls on the Grand Canyon lie in the Havasu Indian Reservation that requires a permit to cross. Explore the village of Supai about eight miles away from the trailhead. 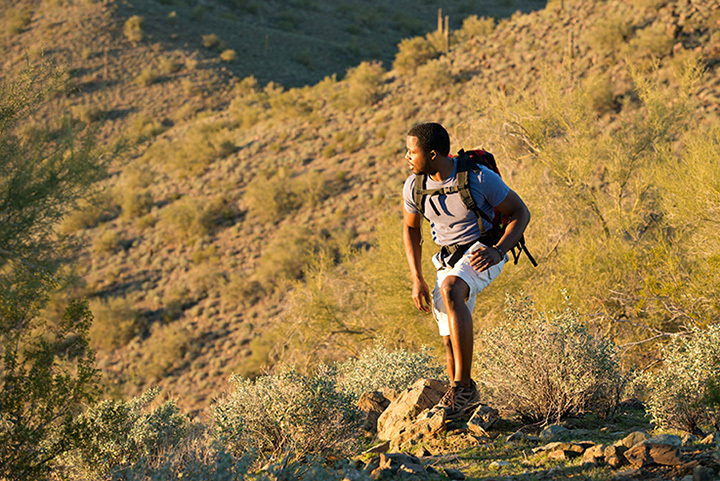 View more Arizona Hiking Trails.